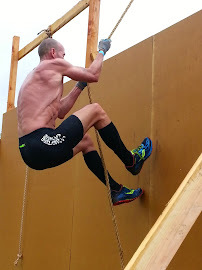 Last week's workout involved training mental fitness. It's one thing to workout outdoors when it's warm and sunny and the conditions are perfect. However, when it's cold, raining, and you're soaking wet it changes everything. 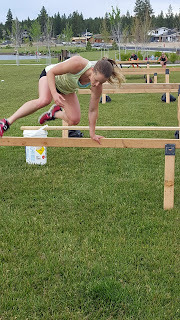 In keeping with our theme for the program, "8 Weeks to Badass", we are not only working to improve the physical fitness of everyone in unconventional ways, but also helping to train their minds to block out those feelings of wanting to quit, or negative self-talk...ultimately making them a rugged athlete. The temperatures were in the high 40's last week while it was raining for the majority of the workout. We had everyone bring a backpack weighing between 20-30 lbs that they would wear for the length of the workout. 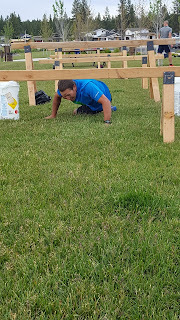 After the warm-up, we didn't waste any time getting everyone uncomfortable. 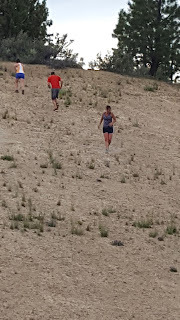 To start the workout, we had everyone fully submerge in the pond, (50ish degree water) and then immediately put their packs on and begin climbing the 200m steep hill. The rest of the 45-60 minutes would consist of hill repeats and dips in the water with several exercises. Not one person complained and it seemed as if they actually enjoyed it. 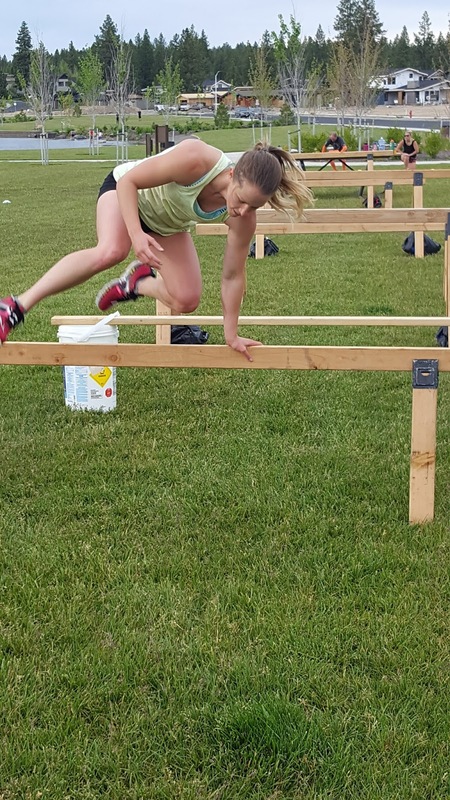 In addition to the one outdoor workout during the week, everyone continues to follow our 4x a week Rugged Regimen workouts that include a track workout, a strength workout, and either a work capacity and stamina workout). Week 4 brought us to COCC College for last weeks training. Unexpected, they were setting up chairs on the field in preparation for graduation. So we had to improvise our setting up of equipment, which wasn't that big of a deal, just limited on our space we could use. 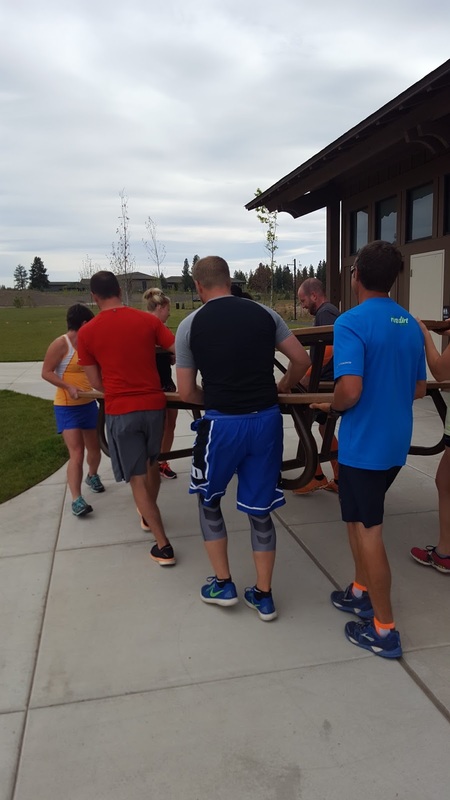 After warming up, we had everyone run down and up a short steep hill, do some "duck unders" on the railings, then carry a 40lb bucket 400m. We split the group up into two teams of 4-5. We started with a TRX Tire Drag competition that had a penalty for losing. As the Navy SEALS say, "it pays to be a winner". 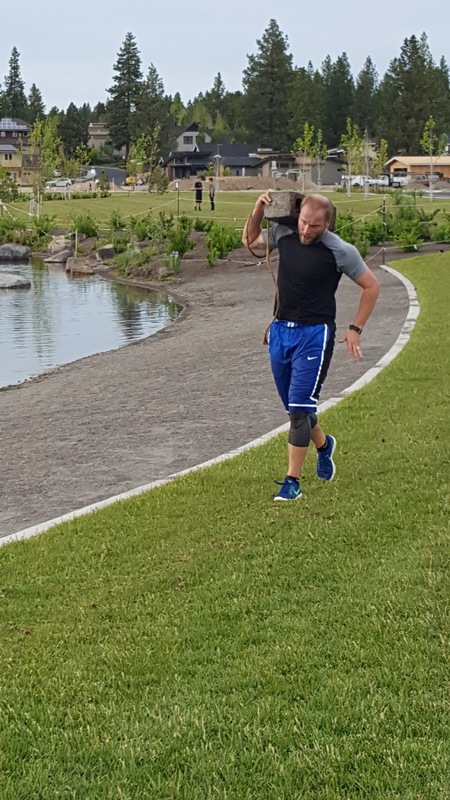 Each person had to drag a 30lb tire 20 yards, go around a cone, and return 20 yards. before handing off to the next person in line. It was a close, exciting finish as one team had a large lead, but almost lost it in the end. As a result, the losing team had to fireman carry the other team 40 yards. There were 5 pairs of exercises, each pair to be completed twice before moving to the next pair. If one team happened to finish before the other was done, they were directed to a "wild pair" of either sledgehammer slams or plate halfmoons. 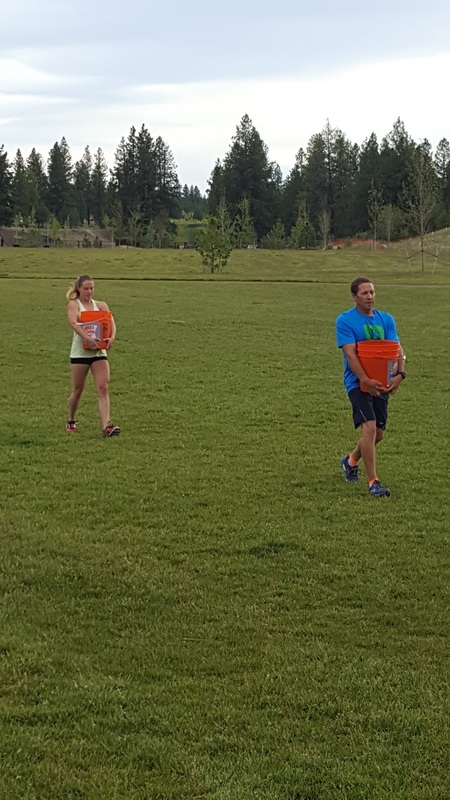 We are starting week 4 this week of our "8 Weeks to Badass" training camp, held Wednesday's at 5:30pm and at various locations in Bend. 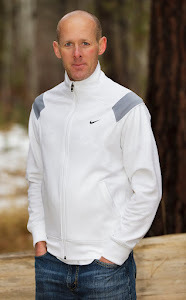 Most have also been following along with our Rugged Regimen plan; which is a 4x week, 8 week plan. Each week they are doing either a work capacity, strength, stamina or single mode endurance workout. 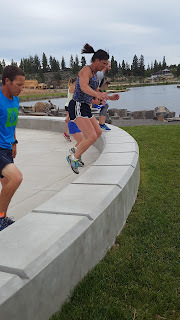 The Wednesday nighter outdoor workout incorporates all in one workout.